I have so many favs this weeks its not even funny. Fantastic job guys! feralfemenine - I am totally in love with Panama Jack! It's such an unusual combination of colors, but they go together so beautifully! 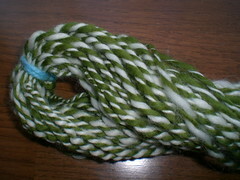 Will private swap for handspun yarn! I live like a hermit in my own head. wow, the handspun is great! I love the how now brown cow, the blue & brown goes very well together! Greenery... I'm on a green kick. i love it! I want to pet the first one lol. I'm now trying to convince my mom that she should buy me a spinning wheel and everything so I can make my own yarn. somehow I don't think she's going for it. everybody's yarn is absolutly gorgeous. Your spinning wheel looks beautiful!! The yarn you spun is great too. I use an antique wheel similar to yours and really enjoy using it. Ack! for some reason my picture didn't post. I'll try again. This is Wonkaville, 65 yards of super-bulky wool that I'm knitting up for a DS Case. My favorite has to be panama jack. 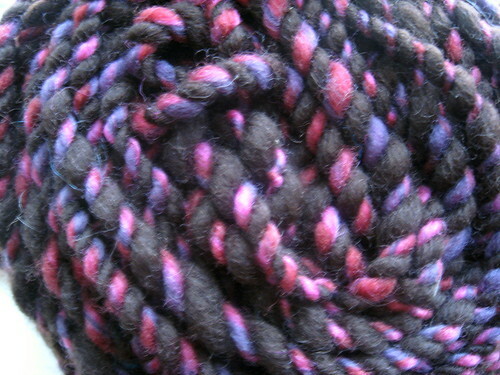 I managed to spin up quite a lot of yarn this week but did not take pictures in time. I will try to do so in time for next week. I think I'm about to become a spinning fool since found someone who is willing to trade web services for yarn and soap. Great job everyone! I hope to post more often these days since I have renewed last year's resolution to spin a skein a week. Since I pulled off 2 last week, and a lot of plying, I think I am on track! I like making stuff. Rumor has it, I'm an elf. Like a Santa Elf, not one of those elegant LOTR types. Mostly because I compulsively craft and partially because I have green shoes. I am excited to be participating in Fiber Friday (even though it's technically Sunday)! It's about 40 yards of roving I got from the Flying Ewe on Etsy a long, long time ago when I first thought I may take up spinning. I'm pretty happy with it, though there are some places the plying isn't so hot and there's a lot of twist in one of the singles that didn't get worked out with plying.. BUT, I imagine those types of things will get better with time. I feel hardly worthy to participate, but everyone's yarns are so inspirational!